We recognise the importance of our heritage and tradition, but understand the needs of our customers, in an increasingly fast paced world. We’re a small, friendly team, and will always go the extra mile to deliver the very best product and service, when you need it. A lot of this is down to our people and our tried and tested systems, but also our location at the heart of West Yorkshire. Huddersfield is undoubtedly the heart of the British Textiles Industry. The majority of our suppliers and mills are within West Yorkshire. Sitting in the middle of the country, with great transport links, we’re perfectly positioned to offer a next day delivery. Our cloths aren’t ‘fast fashion’, they take time, skill and craftsmanship to produce, but our stock supported service means you don’t have to wait. We aim to hold stock of all our cloths, all the time, ready for your cut length orders. 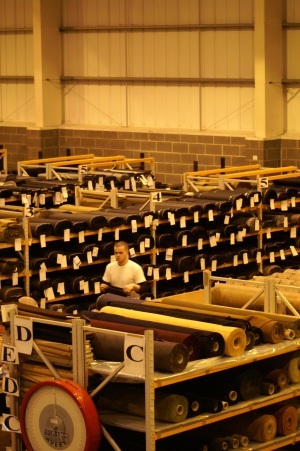 Our modern warehouse stores hundreds of rolls of cloth. With our bespoke 12m cutting table, and expert staff with a passion for fabric we ship cloth to customers in 60 countries worldwide. We pride ourselves on delivering cloth of the very highest standard. Before it leaves our warehouse each piece of cloth goes through 4 levels of quality control. First, when it comes off the loom, then when it’s been finished, as it arrives at our warehouse and again, while it’s being cut for your order. We understand that your customers can be demanding, and that you often need to work to tight deadlines, that’s why we aim to deliver next day, to UK & Europe, for cut length orders received by 2pm. The real beauty of our cloths is often in the handle, the way they feel and how the colours look against your skin. That’s why we are happy to send small swatches to tailors or individuals, free of charge, before you buy. Please contact us to request samples. With customers in 60 countries worldwide, we know that while we’re sleeping, some of you are in the middle of your working day. We list stock levels online, so you can always get the information you need, when you need it. See up-to-date stock levels on the Fabric Collections pages, or download the Stock List here. 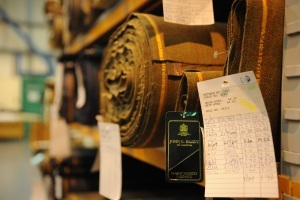 Martin Sons & Co, specialises in creating the Finest British Fabrics for the world’s leading design houses. Whether you choose from our seasonal collection, or work with our designers on a bespoke pattern, we can provide sample lengths prior to bulk orders. Read More about Martin Sons & Co.